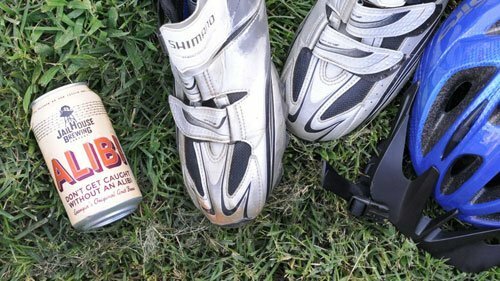 In honor of the end of BRAG (Bicycle Ride Across Georgia) in Brunswick on Saturday I decided I would ride my bike followed by a good beer. I only rode 9 miles on the canal while the real riders were finishing up the last leg between Jesup and Brunswick. But I still deserved a good brew. I’ve ridden that route in BRAGs past. One of the last rest stops outside Brunswick is always at this little Baptist church just before you get back on the main highway. For about 2 miles you ride in on a tree lined road that is so shaded that the temperature drops about 10 degrees. A wonderful stretch of road. Then you stop at this little church and drink the worst Powerade of your life. The water in this area is so sulfur laced you think you’ve been sucking on a firecracker. The water is nasty. I digress. 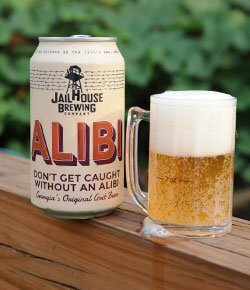 Jail House Brewing is in the old jail in Hampton, GA. I was raised just a few miles outside of Hampton. Not much in Hampton…. just the Atlanta Motor Speedway and the FAA control center. I have one of their pint glasses I snagged from Slices pizza joint in Griffin just a few days after Jail House hit the market in the Fall of 2009. Since the’ve set up shop in an old jail their beers have names like Misdemeanor Ale, Mugshot IPA and Slammer Wheat (which I will be reviewing soon). I had tried this beer last year and lost my notes. I got a can from the Vineyard to celebrate BRAG week (they journeyed from Athens to Washington to Thomson to Louisville to Metter to Jesup then Brunswick —- about 55 miles per day). This brew changes profile after the first sip. Must mess with your taste buds. First sip reminds me of an east coast IPA. Has a bit of a dry mouthfeel. Now my rest stop was disrupted by a big dumb dog who kept dropping a nasty tennis ball in my lap to throw. By the time I could get to the second sip it started to loosen up a bit and seemed a bit smoother. I kept thinking about it being made with grits and I could swear it was starting to taste like grits. It has a little bit of sourness on the edge of your tongue almost a lemony taste… but only on the edges. After it warms up a bit it almost seems malty. This is a great summer brew. And the ABV is 4.5% so you can enjoy more than one. Many brewers have been pushing the envelope and getting lots of bold flavors but at the expense of having a high ABV. This brew has some good flavor without that expense. So, I bought a can. I think I’ll be going back for a six. So I salute all the cyclists that braved some nasty thunderstorms earlier in the week and the nasty sulfur water at the end, and the brewers at Jail House. Nice brew.